Interfaith Matters works with clergy and community leaders in diverse and deprived neighbourhoods across London. 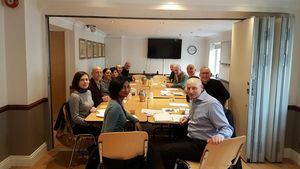 The charity seeds and supports neighbourhood based interfaith forums that meet regularly for dialogue and to organise locally relevant activities for the common good and public benefit. In addition to regular dialogue, clergy visit schools to demonstrate the convivial, collaborative and constructive relations they have developed. In other neighbourhoods members work with councils to ensure services meet local needs. For example, in Hackney and Haringey clergy are working on a plan to provide additional school places and affordable housing. Interfaith Matters approach emphasises the importance of long-term, ongoing inter-religious relations. The charity tends not to be event based or incident driven. “I would like to thank you personally for the initiative you have shown in taking forward interfaith work in Westminster.” Reverend Andrew Tremlett, (at that time) Canon of Westminster Abbey. authority’s work on community cohesion.